Copywell Australia provides professional printer, photocopier & fax machine sales and repair services throughout Melbourne. Able to service all major brands including: Lanier, Sharp, Fuji Xerox, Canon, HP, Ricoh, Samsung, Lexmark & Brother, makes us your first choice for all your printer, photocopier and fax machine repairs and sales. Based in Dandenong, Melbourne, Copywell Australia specialises in repairing, servicing and sales of colour and black / white printers and copiers, fax machines and production multifunction machines. Copywell and its team are dedicated to providing customers with professional first class service and support and whenever possible, same day service and repairs of equipment to ensure minimal disruption to your business. Unable to afford or perhaps justify buying new photocopiers or printers for your home or office? Not a problem, we also offer a wide range of flexible long and short term copier and printer rental / leasing solutions that are not only very affordable but can be tailor-made to suit your requirements and budget. Copywell Australia, your number 1 choice for all your new and used printers, photocopiers and fax machine sales, service, repairs, maintenance and leasing requirements. with over 25 years experience repairing copiers and printers we offer fast, reliable and affordable servicing and maintenance solutions throughout Melbourne. We specialise in fault finding and trouble shooting, networking issues, preventative maintenance and only use genuine parts for all your equipment. Got an issue? we will fix it! Unable to afford to buy office equipment outright or just cannot justify buying a copier or printer only to ave it obsolete in a couple of years? Then why not explore the many upsides of renting / leasing instead? We offer long and short term copier and printer rental solutions which are both flexible and very affordable - 100% tax deductible. We stock a large range of both new colour copiers and ex-demo / used colour copiers which are ideal for the home or office. Whether you wish to scan to email or folder on your desktop, print in A3 or send your document in A4 colour, then our colour photocopier machines can do it all. Brands include: Ricoh, Samsung, Kyocera and Fuji Xerox. 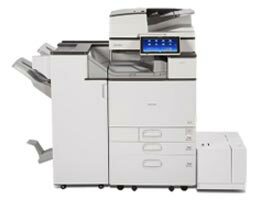 We stock a large range black & white multifunction copiers. Our twin laser copiers offer outstanding quality and reliability and can be configured to provide your business with a powerful network printing and scanning system. Our multifunction photocopiers are the ideal choice for a fast paced, small office and departmental work groups. We stock an extensive range of compact colour printers with brands including: Ricoh, Fuji Xerox and Kyocera. Our printers are fast, reliable, have small footprint, network printing capabilities and produce outstanding high quality prints every time. Our copiers boast the lowest cost per copy in the business which will save you money on running costs. We sell a wide range of compact black and white printers with brands including: Ricoh, Lanier, Samsung, Fuji Xerox, Sharp, Canon and Kyocera. These B/W printers posses amazing print quality, impressive print speeds, are network compatible and boast the lowest running costs while providing optimum performance. Simply put - printing performance at its best! If it involves copiers, printers or faxes then we have the solution your business needs!